A new DVD featuring Mauchline at Work over the years was completed in July 2009. The inspiration for this project came from Willie Lyle. The source material comes from the archives of ayrshirehistory.com and is from many different collections, and not exclusively from that of Willie Lyle. 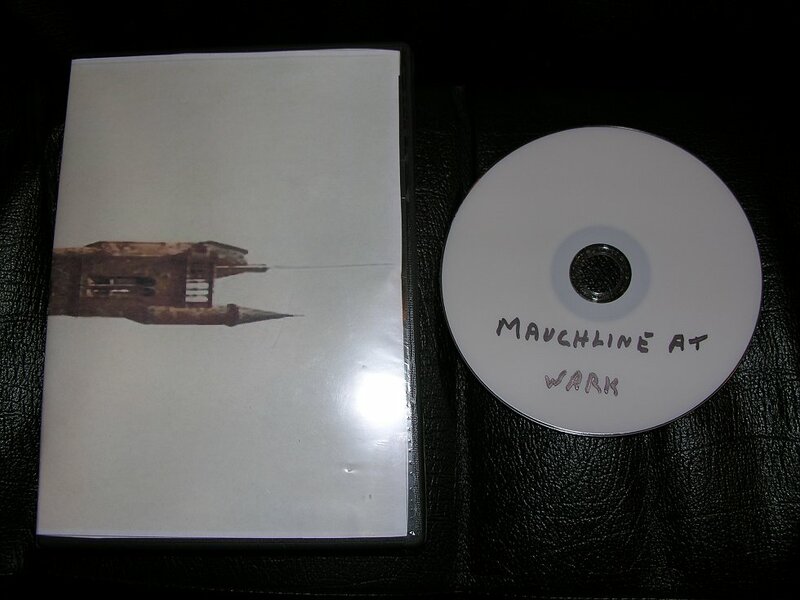 The DVD is only being shared amongst local people in the Mauchline area, and is not for sale or resale. However, anyone who downloads this is from the web is free to buy a round the next time we meet in Poosie Nansies!!! The AVI version does not have the DVD menu structure, but should play OK. I might have noticed an odd stutter on the avi version, maybe not. Anyone who has success in downloading this, do contact ayrshirehistory.com and let me know how you get on. The titles still give the address of ayrshirehistory.eu, which was a temporary address while the .com domain was being reclaimed. A new and updated version will be uploaded in due course, with only the .com address. The content will however be identical. The file is large, 650 megabytes, so a fast broadband connection will be required. During trials, a friend in the next village with a broadband speed 10 fold that of my own out here in the sticks, brought the file down in an amazing 15 minutes!!! There are a number of players which will show an AVI file. One of the better ones that plays multiple formats is VLC player. It copes with virtually any video format, and is free!! It has come to our attention that copies of our FREE ayrshirehistory.com DVD called "MAUCHLINE AT WORK" are being sold for profit in the Mauchline area by unscrupulous characters. WARNING: If you have been a victim, you are paying for something that is already a free download You are being well and truly ripped off, and perhaps even funding organized crime. Anyone selling the DVD is not authorized to do so. The movie was produced in memory of Willie Lyle of Mauchline, who's glass negatives and slides feature on the production, though not exclusively. The original production features images from many sources, and thus could not be sold for profit, without a lot of extra work on copyright. Therefore it was decided that in memory of Willie, this would be distributed, copied, shared and made available for download to all. Distribution is encouraged. Reselling is strictly forbidden. Plans were at an advanced stage to sell the production at Mauchline Holy Fair 2011, with proceeds going towards the MS charity that some local people are currently raising funds for. A local group plan to climb "The Three Peaks" (Ben Nevis, Skafel Pike, and Snowdon) in the summer. The DVDs will not now be included in this fund raising. This is not the first time that someone has ripped off ayrshirehistory.com. Not long after the appearance of Willies unique glass negative of Mauchline Boxworks, one character e-mailed the image to a dubious Canadian web outfit, who published the image with credit given NOT to Willie Lyle and ayrshirehistory.com, but to himself!! They never even managed to change the file name, nor check if the image was already on line. It's amazing what google turns up!! It has been said that "imitation is the highest form of flattery", but I have not spent years of work on this site, and related video projects to fill someone elses pockets for free!!! !